The recent volunteer efforts of 2PM’s Nichkhun in Tanzania will be airing in a Korean documentary this week. Nichkhun spent two weeks in an island village in Tanzania with Taecyeon, Lee Tae Ran, Park Sun Woong, Kim Hyuk and 23 other volunteers recently as part of the MBC volunteer documentary, KOICA’s Dream. From the first day of arrival upon the village, the crew encountered hardships as it found its major supplies had not arrived. Nichkhun and the others wasted no time in crafting basic supplies for themselves including making chopsticks out of wood and cutting up bottles to use as dishes. The entire team spent the two weeks camping outdoors in tents and lived frugally with water and food rationed out for each individual. 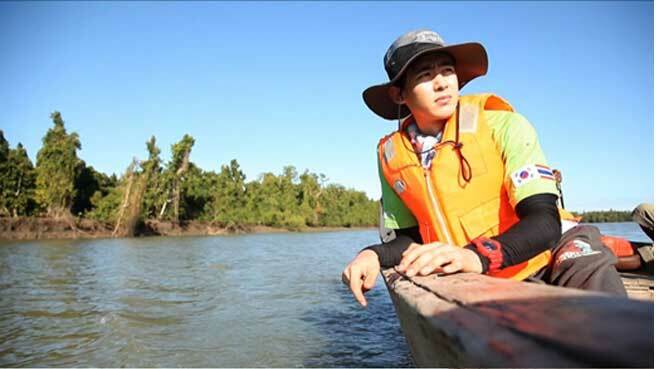 Nichkhun also ventured out with a team by boat for eight hours to find fresh water and also faced a crisis when their boat suddenly stalled as Nichkhun got a taste of what incredible hardships the locals faced every day. The full story of the volunteer team’s time there will be seen when the documentary airs on MBC on December 12.